AMROTEC X-1000 - Technology Unlimited, Inc.Technology Unlimited, Inc. High-performance; heavy-duty currency discriminator with a dedicated reject pocket. It is equipped with the most comprehensive, user-friendly functions necessary for high-volume bank tellers and retail cashiers in such cash handling environment. 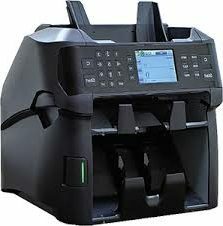 With an ergonomic design, 3.5″ color TFT Color display and user-friendly symbolic user-interface for users, the X-1000 not only provides tellers trouble-free operation and an efficient working environment, but, also allows uninterrupted counting experience with dedicated reject pocket, thus increase productivity and job efficiency.